Na staré hospodě. Photo from 1931. Na Kocourku was a pub in Putim where the gendarmes sent old Pejzlerka to fetch food and drink. There is no description of the inn, almost the whole plot takes place at the police station. Na Kocourku was a pub in Putim, the name is invented. At the time there were three pubs in the village: U Srnků (where U Cimbury is today), U Pavlů, and Stará hospoda. The latter is the more likely candidate, but as the whole Putim incident (including the police station) is invented, there shouldn't be too much emphasis put on the "facts" in this particular case. [2.2] „Tohle je velká výjimka,“ důstojně řekl strážmistr, „to je nějaký vyšší důstojník, nějaký štábní. To víte, že Rusové na špionáž sem nepošlou nějakého frajtra. Pošlou mu do hospody ,Na Kocourku’ pro nějaký oběd. Jestli už nic není, ať uvaří něco. U černého koně was a pub where the gendarm Rampa was playing cards even when on duty. U černého koně was, according to the novel, a pub in Protivín. No confirmatory information is available. [2.2] Strážmistr zůstal sedět na strážnici vedle Švejka na kavalci prázdné postele četníka Rampy, který měl do rána službu, obchůzku po vesnicích, a který v tu dobu klidně seděl „U černého koně“ v Protivíně a hrál s obuvnickými mistry mariáš, vykládaje v přestávkách, že to Rakousko musí vyhrát. Bezirksgendarmeriekommando is the scene of the end of Švejk's Anabasis. Rytmistr König soon verified that Švejk was no Russian spy, and dispatches him im-promptu to his regiment in Budějovice. Bezirksgendarmeriekommando was the former regional state police headquarters in Písek. The location of the police station is not known. [2.2] Závodčího zmocnila se naprostá deprese, a když po hrozném utrpení pozdě večer dorazili do Písku k četnickému velitelství, na schodech řekl úplně zdrceně závodčí Švejkovi: „Teď to bude hrozné. My od sebe nemůžem.“ A opravdu bylo to hrozné, když strážmistr poslal pro velitele stanice, rytmistra Königa. První slovo rytmistrovo bylo: „Dýchněte na mne.“ „Teď to chápu,“ řekl rytmistr, zjistiv nesporně situaci svým bystrým, zkušeným čichem, „rum, kontušovka, čert, jeřabinka, ořechovka, višňovka a vanilková. Mariánská kasárna plays a prominent role in this chapter as part of the plot takes part in this garrison in Budějovice. This is where Švejk and Marek spent three days together in the regimental prison. Mariánská kasárna was a garrison-building in Budějovice which housed the replacement battalion of IR91 where Švejk and Lukás served. Jaroslav Hašek himself served here from 17 February to the end of May 1915. His experiences here are to a large degree retold by his alter ego Marek. The school for Einjährigfreiwilliger which Hašek attended was on the third floor. The building also housed the Regimentsarrest, a place which Švejk and his creator knew very well. On 1 June 1915 the replacement battalion of IR91 was transferred to Királyhida under circumstances very similar to those described in the novel. Their replacement was as in the novel a Hungarian regiment, IR101 from Békéscsaba in south eastern Hungary. The building was in 2014 dereclict and only partly used. By the main entrance there is a memorial plaque to Jaroslav Hašek. [2.2] Po celé cestě se Švejkem od nádraží do Mariánských kasáren v Budějovicích upíral své oči křečovitě na Švejka, a kdykoliv přicházeli k nějakému rohu nebo křižovatce ulic, jako mimochodem vypravoval Švejkovi, kolik dostávají ostrých patron při každé eskortě, načež Švejk odpovídal, že je o tom přesvědčen, že žádný četník nebude po někom střílet na ulici, aby neudělal nějaké neštěstí. K.u.k. Reserve-Spital is mentioned indirectly by Marek when he relates how he used the Regimentskrankenbuch to nip out of the hospital to enjoy himself on the town. The name of the hospital is not used explicitely. K.u.k. Reserve-Spital was the hospital in Budějovice where Jaroslav Hašek reportedly performed the same trick with the hospital book as Marek did in Švejk. Jaroslav Hašek was hospitalized here from 6 March 1915, suffering from rheumatism and heart problems. The hospital was located in former Landwehr barracks. The building is still in military use and is located near the railway station at in Žižkova třída, in 1915 still Radetzkygasse. Port Arthur was a whorehouse that was visited daily by Marek. By doing this he hoped to contract venereal diseases and thus get declared unfit for service. Port Arthur is commonly known as the European term for Lüshunkou, a harbour in Manchuria that was besieged and captured by Japanese forces during the Russo-Japanese war in 1904-05. More important in a Švejk context is that "Port Artur" indeed was a brothel in Budějovice. It was located in Rudolfovská třída in the eastern outskirts of the city, on a hill 401 metres above sea level called Pěkná vyhlídka (ge. Schöne Aussicht). The name literally means "Pretty View". In January 1904 Jan Filip bought the inn Na pěkné vyhlídce (house No. 326) and in the spring it was already operating as a brothel after the had been awarded a license. From the first moment there were reports in the newspapers about disorder, a fact that may have led to the nick-name "Port Artur", inspired by the war in the far east and the siege of the port (the siege started earlier that year). In 1906 the owner Jan Filip appeared in the newspapers, accused of having betrayed the Czech nation and sold his vote for the city council election to the German mayor Josef Taschek. For this favour it was claimed that he was granted a license to run a brothel. The next year "Port Artur" was again in the news due to disturbances, but the negative press from the Czech newspapers smells of a smear campaign against the "Judas" Filip, the German nationalistic Taschek, and Germans in general. Newspapers were at this time, be it German or Czech, full of chauvinistic outbursts. In 1909 a certain Bernard Machatý bought the property and in the address book from 1915 he is listed as horse-cab owner. He seems to have gone broke because nr. 326 was in 1914 sold at a forced auction. Whether or not the brothel continued operating at the address after 1909 is not known, but in June 1915 there was another news item. Two thieves had been arrested and they had been drinking at "a certain brothel" in Rudolfovská třída. This may however not necessarily have been at the same property or had anything to do with "Port Artur". Otherwise the address book for 1915 mentions only two brothels in town, but none of them are in Rudolfovská třída. Still unofficial brothels may have been operating and address books may also contain errors. In 1919 another possible connection appears. A note in Hlas lidu titled "A new house of shame?" informs that a certain Mrs. Machatá, the divorced wife of brothel owner Machatý, has sold the joint Tripolis and is about to establish another one. This happened in the northern part of town, not far from Mariánská kasárna. The horse trader Felix Vazda advertises in 1919 Dutch horses for sale from this address and from 1920 to 1947 adverts show that the furniture factory of Václav Vazda (f. 1889) was located here. He had moved to the city from Ledenice. On the other hand local historian Milan Binder informs that the site was used by hospoda Na Mýtě. After the war the brothels were closed and it appears as if the place was converted to a regular inn. This may even have happened as early as 1909. A note in Budweiser Zeitung from 1924 reports that Mautwirtshaus now also had a Czech name Hostinec na Mytě. But at first it appears that "na Mytě" may not be at the address of "Port Artur" because the house numbers don't fit. Today the construction firm Edikt As is housed here but the number is 461, not 326 as one would expect. Number 326 does not exists in the area any more. Milan Binder adds that buildings in Budějovice have been renumbered twice, latest in 1979. This at least explains why the building numbers don't fit. [2.2] Denně jsem chodil do ,Port Arthuru’, někteří kolegové už dostali zánět varlat, řezali jim pauchy, a já jsem byl pořád imunní. Smůla, kamaráde, nekřesťanská. Až jsem se ti jednou ,U růže’ seznámil s jedním invalidou z Hluboké. U růže is mentioned as Marek met a cripple from Hluboká here who could help him with rheumatism. U růže probably refers to U bílé růže, a pub two doors north of Mariánská kasárna in Pražská ulice 5, Budějovice. The inn has existed at least from 1879 and was used also for meetings, for instance election gatherings. In 1884 František Smauš announced that he had taken over the inn that at the time also was known as U hlavů. In 1896 there were puppet shows here and the landlord at the time was Jindřich Kopecký. He is also listed as innkeeper in 1905 when he advertised a carousel for sale. This apparatus has surely had its place in the restaurant's garden. In the 1890s they sold beer from Protivín but we don't know if this was still the case in 1915. The landlord as of 31 December 1910 was František Vostl (also written Wostl), a person Jaroslav Hašek most definitely would have known as he is still listed as innkeeper in 1915. Vostl also ran a horse cab business and traded in fish. He died on 22 June 1933 at the age of 62. He was landlord at U bílé růže at least until 1924 and frequently placed adverts in Jihočeské listy wishing his customers "Happy New Year". The premises were used as an inn even after WW2 and he building was demolished as late as 1992. Hašek at "The White Rose"
An article in Jihočeské listy from 9 January 1937 confirms that Jaroslav Hašek visited the pub back in 1915. He entertained guests with his patriotic shouting. The article is signed with the pseudonym Al. Terego mentions that the pub also was called simply "U růže". Marek may also have had the café U černého růže (Zur schwarzen Rose) in mind. It was situated on the corner of Piaristická ulice and Česká ulice. This hypothesis is however much weaker as the joint was located further away from the barracks and it also seems to have been largely frequented by Germans. Proprietor in 1915 was Anna Czech. Zmiňovaná hospoda "U růže" bude určitě hospoda "U bílá růže", která byla hned vedle Mariánských kasáren. Informace o ní najdete také v knize "Zaniklé hospody", na straně 157 a 158. [2.2] Denně jsem chodil do ,Port Arthuru’, někteří kolegové už dostali zánět varlat, řezali jim pauchy, a já jsem byl pořád imunní. Smůla, kamaráde, nekřesťanská. Až jsem se ti jednou ,U růže’ seznámil s jedním invalidou z Hluboké. Ten mně řekl, abych jednou v neděli k němu přišel na návštěvu, a na druhý den že budu mít nohy jako konve. Měl doma tu jehlu i stříkačku, a já jsem opravdu sotva došel z Hluboké domů. Měšťanská beseda according to Marek serves good food, as opposed to the garrison arrest where he and Švejk are locked up. Měšťanská beseda was a community building, restaurant and hotel in Budějovice that existed from 1870, owned by the citizen's association Českobudějovická Beseda. It was primarily used by the Czech part of the city's population and it was here Český akciovný pivovar (now known as Budweiser Budvar) was founded in 1891. The brewery commenced operation in 1895 and it is a foregone conclusion that the restaurant served beer from this brewery (and they still did at the outbreak of war). From July 1914 and at least until 1922 the Beseda restaurant was run by Vilém Sandholec, brother of the owner of Hotel Slunce at Náměstí (the square). According to Radko Pytlík the restaurant was indeed frequented by Jaroslav Hašek so Marek presumably knew well what he was talking about. In 1924 the building was rewamped and in 2015 the restaurant was still open but we don't know if it's been operating continuously since then. [2.2] Himlhergot, není co kouřit, kamaráde. Nechcete, abych vás naučil plivat na strop? Podívejte se, to se dělá takhle. Myslete si přitom něco, a vaše přání se splní. Jestli rád pijete pivo, mohu vám odporučiti výbornou vodu tamhle ve džbáně. Máte-li hlad a chcete-li chutně pojíst, doporučuji vám ,Měšťanskou besedu’. Pionierkadettenschule Hainburg is mentioned as Marek tells Švejk about the moronic fähnrich Dauerling who did his training at this school. Pionierkadettenschule Hainburg existed from 1869 until 1913 when it was promoted to a Military academy. The institution was located at the Schloss. [2.2] Mladý Dauerling po hrozném zápase s čtyřmi třídami nižší reálky, které vystudoval soukromě, přičemž předčasně zešedivěl a zblbl jeho domácí učitel a druhý chtěl skočit v zoufalství se svatoštěpánské věže ve Vídni, přišel do hainburské kadetní školy. V kadetce se nikdy nedbalo na předběžné vzdělání, neboť to většinou nehodí se pro rakouské aktivní důstojníky. Stephansdom is mentioned because Dauerling's teacher wanted to jump off the steeple of this cathedral due to his pupil's gross stupidity. Stephansdom is the most important cathedral in Vienna and one of the city's major attractions. Theresianische Militärakademie is a place where, according to Marek, the biggest idiots end up. Theresianische Militärakademie is the oldest military academy in the world, founded by empress Maria Theresa in 1751. All the officers of Austria-Hungary were educated here. Today it is Austria's only remaining military educational establishment. The academy is located in Wiener Neustadt. [2.2] Jeho odpovědi při zkouškách jasně hovořily o tom neštěstí a vynikaly takovou pitomostí, a byly považovány přímo za klasické pro svou hlubokou pitomost a popletenost, že profesoři kadetky jinak ho nenazývali než ,unser braver Trottel’. Jeho hloupost byla tak oslňující, že byla největší naděje, že snad po několika desetiletích dostane se do tereziánské vojenské akademie či do ministerstva vojenství. Apollo is mentioned in the story Švejk tells Marek about the first wounded of the war, a certain Mlíčko. In the Apollo someone tore is wooden leg off and whacked him over the head with it. 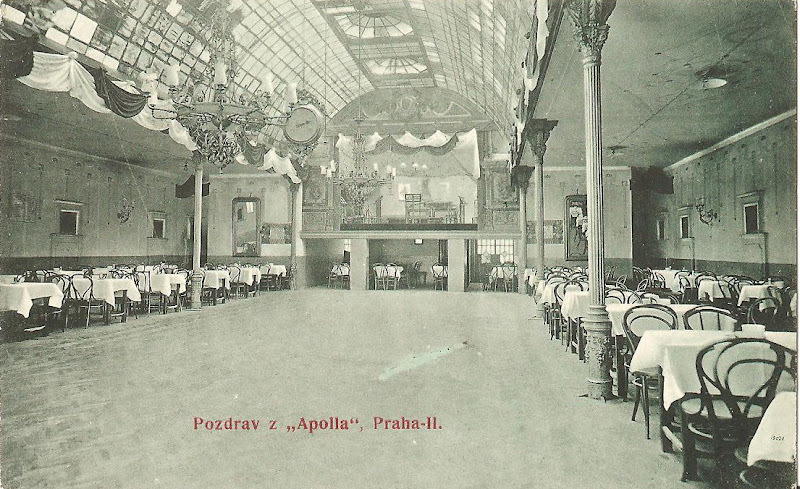 Apollo was a large night cafe with dancing at Fügnerovo náměstí in Nové Město, not in Královské Vinohrady as Švejk says. It was included in E.E Kisch's list of 11 establishments that were forbidden to enter for members of the k.u.k armed forces . In early February 1915 an advert for "dance entertainment" appeared in Národní Listy, and it confirms that František Štastný was still the landlord (he is listed as such in the address book of 1910). [2.2] Jednou přišel do ,Apolla’ na Vinohradech a tam se dostal do sporu s řezníky z porážky, kteří mu nakonec utrhli umělou nohu a praštili ho s ní přes hlavu.